Home » ★☆☆☆☆ » Wing Lei. Give it the gold finger. Wing Lei. Give it the gold finger. I’d got it all planned. 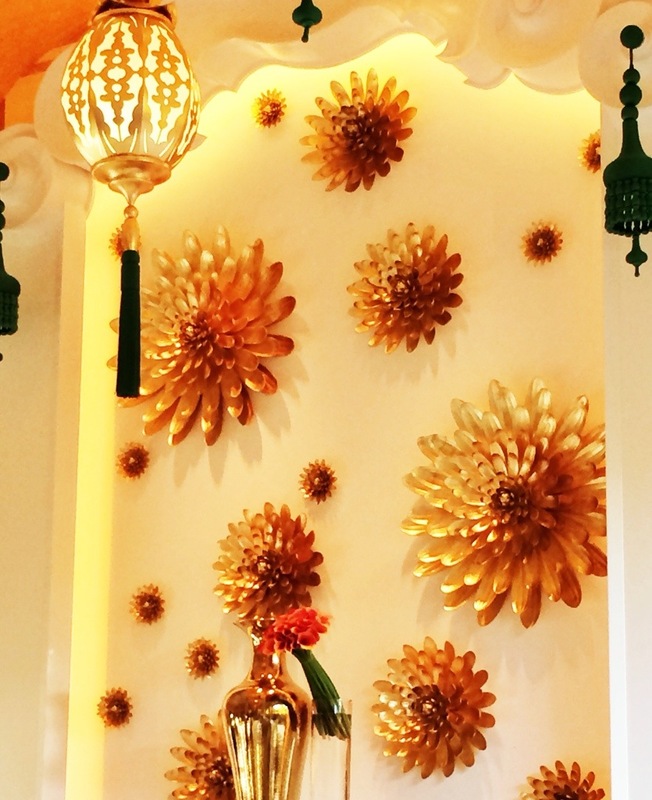 My male pedicurist/food truck chef had recommended Lotus of Siam, five minutes away from the ode to overshlog that is our hotel, the Wynn, Las Vegas. Covering 250 acres, boutique this is not. Do not ask what I am doing here. For those of you who don’t know, the Wynn is the brainchild of Steve Wynn, hotelier extraordinaire. For a gambling mogul, his name is a Wynn- win. C tells me (for he is fascinated by these things) that the market capitalisation of the Wynn group is $21bn. I do not know what that really means but when I see the many thousands of dollars bet every few minutes on the tables, I confess that something in me dies a little. We rang the Lotus and they couldn’t say how long we’d have to wait before we got a table. C doesn’t do uncertainty and I wasn’t in the market for Richmond-face so I caved and agreed to eat in the hotel. Out of the myriad choices, we decided to go for Chinese. There’s a poshed-up version, Wing-Lei. Apparently the name translates to “forever prosperous”. At these prices, they certainly will be. We walked straight in. Given that there are 2716 rooms in this hotel, alarm bells should have rung. 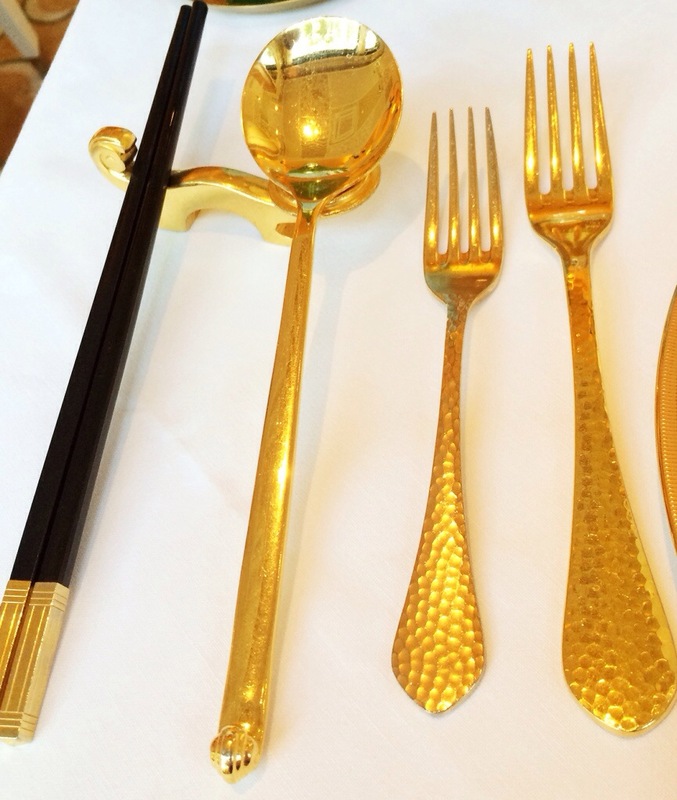 We were taken to our gold leather seats, the table laid with gold cutlery, surrounded by walls decorated with gold flowers, illuminated by gold chandeliers. Remember that gold woman in 007? You wouldn’t even notice her. One of the more reasonable things on the menu (it’s all relative) was the Imperial Duck tasting at a mere $88. Each. Before 15% service. But it looked inviting and I’m a sucker for duck. Unfortunately this duck sucked. To start, duck in buns. 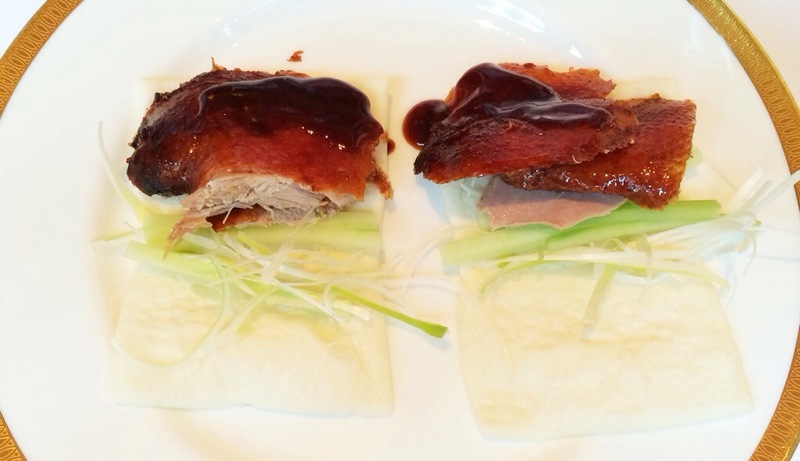 They bring a sad, dry-looking duck to the table and carve four slices, two in each bun. Hoisin sauce pre-applied, it was already congealing on the tepid duck. I wish I’d spent longer than the two minutes it took to eat, because it was by far the best dish that evening. 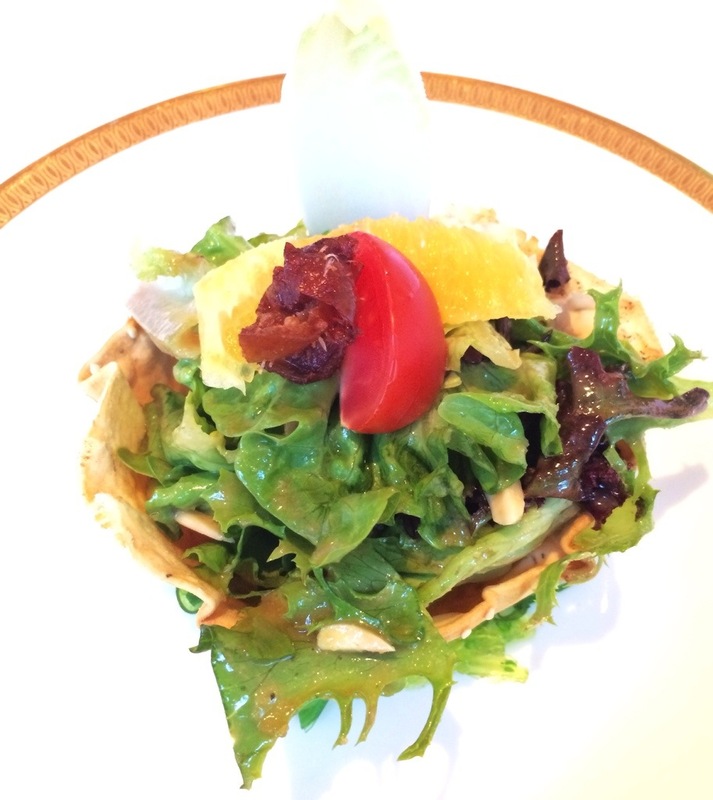 Onto Peking Duck Salad, Mesclun Greens, Slivered Almonds,Mandarin Oranges, Peanut-Truffle Vinaigrette. It sounded delicious. Mind the gap between description and reality. It’s huge. A hairy, crisp curl of what I believe was duck skin, sat balanced on sickly-sweet drowned leaves. I was waiting for the duck to arrive. Nothing. Rooting around in the limp leaves, I found three tiny dice of duck. You can take the casino thing too far. Shockingly mean, shockingly sweet. And on a crisp wonton basket which I suspect was meant to be edible. 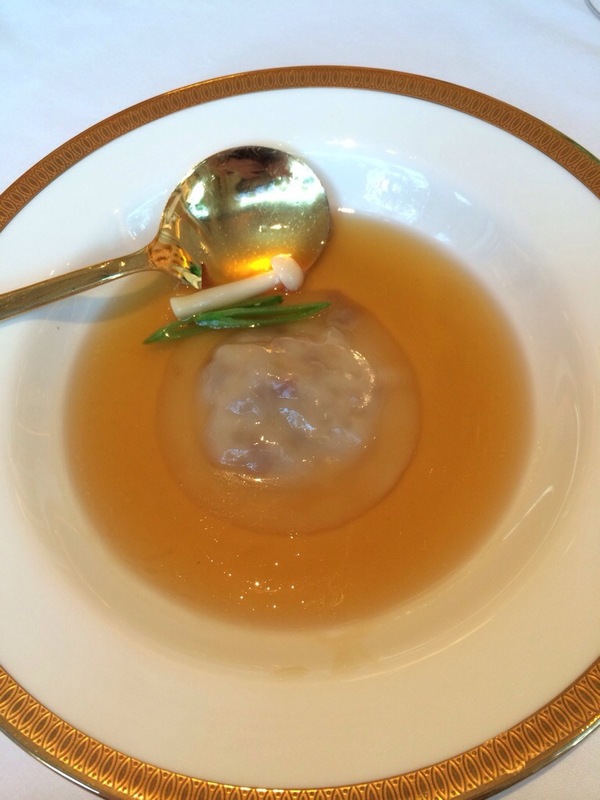 To follow: Duck Wonton Soup, which came advertised with Carrots, baby Bok choi and Mushrooms. Delivered to the table with its own dome, presumably to keep it warm. That strategy needs a re-think. Lukewarm stock, reduced to the point of shiny gelatinous slime, the claggy, heavy wonton stuck firmly to the base of the dish. I had to prise it from the plate with my spoon. I suspect that it had been stuck on that plate, waiting to be drowned in that chicken-flavoured wallpaper paste for some time. Next up the entrée. 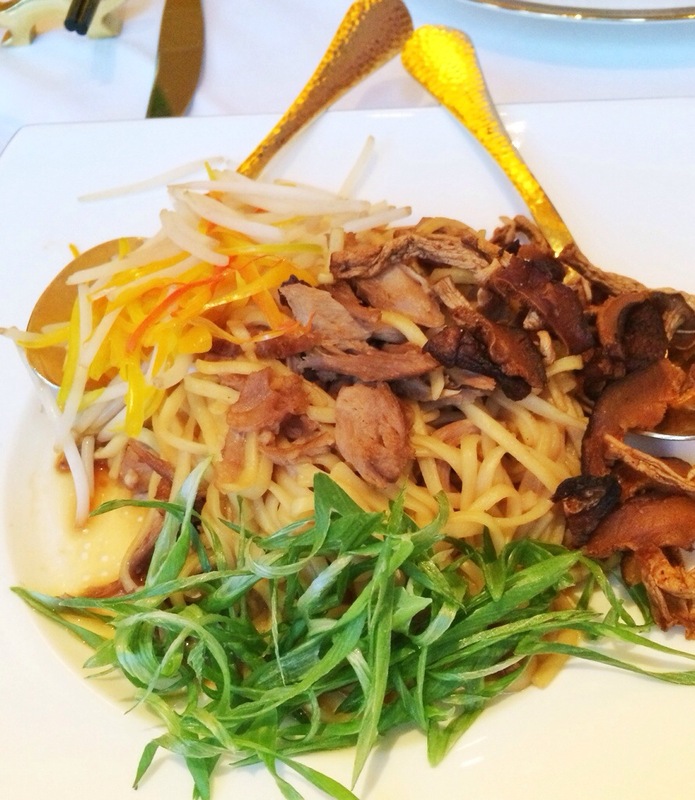 Hand-pulled noodles with – you guessed it – duck and “Asian vegetables” comprising yellow peppers bean sprouts and julienned green beans. Groundbreaking, no? Noodles stuck together with the component parts simply piled on the plate, this was another badly-cooked, flavour-free plateful. The slick of oil it sat in was the tastiest thing on the plate. The dried-out mushrooms were a particularly pointless addition. To get mushrooms to taste of precisely nothing is skilful. Tip: if you would like to recreate this dish at home, just forget to pre-soak the mushrooms. 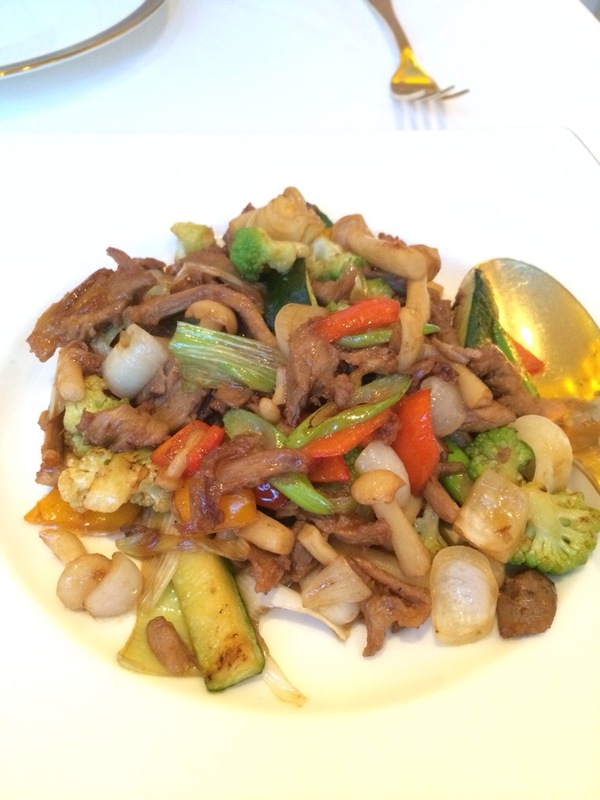 And the Wok-fried duck with Zucchini Cauliflower and Bean Paste was redolent of something you might find in a provincial Chinese restaurant, circa 1975. Maybe not so good. There was a dessert, but I left before it was served. I do not regret that now. I decided after the second course that there was no point in saying anything. It wasn’t that there was anything specific wrong with any one of the dishes. They were all uniformly bad. And despite the excellent all- American super-service, at no point was I asked whether I liked the food. I’ve been told I’ve got an expressive face. Maybe they already knew. Stuck in the middle with eugh. Just wanting to let you know that I love your blog! Do you write for anything other than this site? Thank you. Only a law blog. And some of these appear in the Lawyer magazine. Some of the best photo captions yet. Restaurant sounds horrendous, but I’m afraid to say that I’m glad you went because it meant I got to enjoy this excellent post, which has really amused me. How selfish; I apologise. Glad you enjoyed it. The only enjoyment I got from that meal was being able to write about it. There used to be a good Chinese there, Red something. Has that gone? Always better for us readers if the restaurant is rubbish. Very funny. Brilliant Nicky!! Love the “you wouldn’t even notice the 007 gold chick”!…and I’ve enhanced the colour on the photo…..
You should send to the owner of the hotel/restaurant…..